Anoraks are dusting off their bobble hats and sharpening their tram-spotting pencils in anticipation of Embra trams soon making a reappearance after an absence of half a century. I’m not sure who deserves more opprobrium—the city fathers who first junked the comprehensive network of the 1950s or the ones who managed to bastardise a reasonable concept for revival into the worst transport white elephant that Scotland has seen. Yet. Had they gone with original circle/Line 1 concept, linking city centre with rail-starved waterfront and junked the ‘prestige’ (aka ego-driven) addition of an airport/Line 2 element (that wound up being the ONLY element), they might have been on a winner and shifted the revival of Granton/Newhaven/Leith into top gear. As it is, it’s faster to get to Fife or Dunbar from the city centre than to Ocean Terminal. But I digress: they didn’t. Never build a tram line that duplicates an existing serviceable heavy rail line because capital investment alone—quite apart from competition—make it impossible to be cost-effective. As soon as line 1 was ditched in favour of line 2, this rule was broken and Edinburgh trams transmogrified into the white elephant before you next month, The scale of this FUBAR will only become evident when the Airlink bus comes under threat because it will easily out-compete the insanely indirect line the tram takes to the airport. But, you say, that’s a bus. I thought we were talking about the trains competing. True: we are. Because the other half of the ill-fated (and very expensive) TIE disaster was a white elephant that was thankfully assassinated in the womb in summer of 2007 by the then-new SNP government: the Edinburgh Air Rail Link (EARL). Providing Edinburgh Airport with a station with direct links to Scottish cities is no bad idea. Scotland has among the worst public transport service to/from its airports in Europe. EARL would have dragged Edinburgh’s out of oblivion and into the 21st century. But, given a budget of £650m, had TIE managed EARL the way it managed the trams, they could have muddled that up to £2 billion, no sweat. And, like the trams, the implementation concept was flawed from the start. Check out this map & spot the error. Did you spot it? The four tracks coming west from Haymarket split before reaching the area of the map. Therefore there is NO NEED for duplicate tunnels from both Gogar and Roddinglaw junctions to meet again under the airport: i.e. at least 20% of the cost was unnecessary idiocy. But even more relevant is this concept was hugely and unnecessarily pricey in the first place. It is well for all concerned that Swinney recognised a turkey when he saw one. But, unfortunately, because every other party ganged up to force him to fund the trams, any reasonable alternative for EARL was never considered. This is unfortunate because a far cheaper alternative that Orcadians might call PEARL (Peedie EARL) was available. 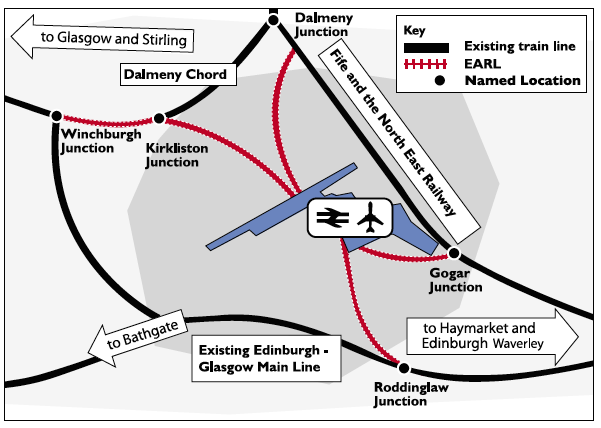 Build a chord (above ground) to connect the station directly to Kirkliston Junction. This achieves all the aims of EARL without a single (expensive) tunnel. It would work better if the revived station could be provided with four tracks to ease congestion. In terms of capital required, £10m for the station, £5m for related infrastructure, £15m for the Kirkliston chord and £10m for quad tracks at the station comes in at £40m. Call it £50m total, with contingencies. This is 8% of the original EARL budget—or a mere 2.5% of what TIE, from past form, would have run up as a bill. All services posited for EARL would be equally possible with PEARL. The trams could even be used to transfer passengers to the station, getting them into town faster than suffering the 11 stops (and 200m walk) into Waverley by tram. Better yet: the entire Almond Valley viaduct and Winchburgh tunnel—both high cost-per-mile structures to maintain—with no passenger trains would be surplus to requirement and be abandoned. The only disadvantage (which applied equally to EARL) is that Stirling/Glasgow trains could no longer serve Edinburgh Park; on the current ScotRail timetable, most don’t anyway. The principle on which TIE was founded–a unifying single transport authority for Scotland’s capital that could co-ordinate large, expensive projects such that they worked together—was not flawed. Indeed, since its demise, the absence of a TIE, or an equivalent that is any good, is glaring. From a country seriously under-investing in the eighties to a modest programme of new stations in the nineties, Scotland naively let the pork-barrel numpties loose in the noughties with pots of money. As a result Airdrie, Alloa and Galashiels services all sucked in burgeoning sums with scant real network improvement to show for it. 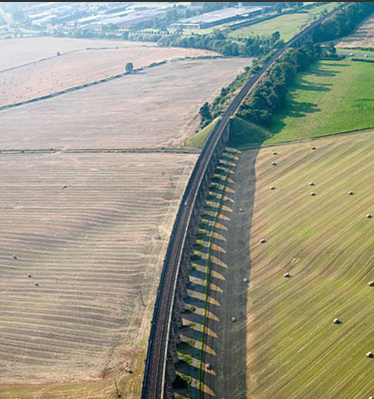 Major projects to improve Waverley and realign the ECML at Prestonpans did little for passengers but cost £60m each. Throughout it all, private companies did only what short franchises required but took several £billion in profits each year while doubling rail fares. To whale on TIE’s shortcoming when our whole transport philosophy was torn between a private-no-matter-what diktat from London (which continued under Labour 1997-2010), combined with an endemic civic jobs-for-the-boys mantra across Scotland’s Central Belt is probably unfair. But fresh-faced MSPs fell over themselves post-1999 to justify their own existence and what better than a sparkly new train/tram for their punters? TIE actually suffered by having its SMT’s rank incompetence shielded by new ministers and self-interested city fathers (& now mothers) who didn’t know enough to challenge it. When the real history of early 21st-century civic Scotland is written, it will point the finger firmly at the absence of adequate scrutiny to combat the professional incompetence of those who have all now taken their comfortable £1m severances, shrugged and moved on. This entry was posted in Transport and tagged Edinburgh Airport, TIE; trams; EARL. Bookmark the permalink.